Caliber: * .32 Special .45-70 Government .30-30 Win. .308 Marlin .25-35 Win. .450 Marlin .444 Marlin .35 Rem. .44 Mag. .338 Marlin .45 Colt .307 Win. All other Lever Loads are Pointless! 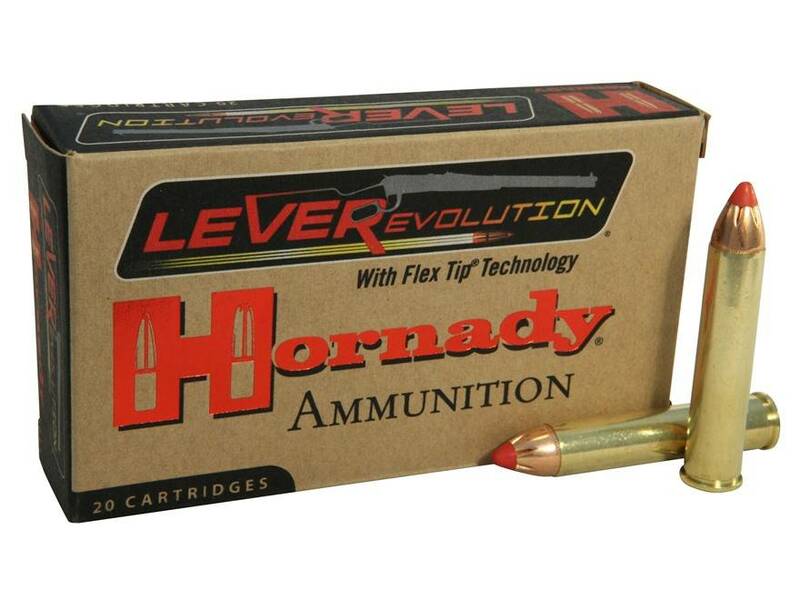 LEVERevolution® represents a breakthrough in ammo design for lever action rifles and revolvers. The key to its innovation and performance is the patented elastomer Flex Tip® technology of the FTX® and MonoFlex® bullets. Safe to use in tubular magazines, these bullets feature higher ballistic coefficients and deliver dramatically flatter trajectory for increased down range performance. Up to 250 feet per second faster muzzle velocity than conventional lever gun loads. Exceptional accuracy and overwhelming downrange terminal performance. Patented FTX and MonoFlex bullets featuring Flex Tip Technology. Up to 40% more energy than traditional flat point loads. The innovative LEVERevolution bullet design may require a newer magazine follower to provide best possible functioning of the last round out of the magazine. These magazine followers may be purchased from the manufacturer of your firearm. For optimum performance we do not recommend storing LEVERevolution ammunition in tubular magazines for extended periods, as this can result in tip deformation. Hornady LEVERevolution ammunition is loaded with FTX and MonoFlex bullets. Not recommended for use in handguns.